For composing solos, and many other types of practice it helps to have a rhythm accompaniment to "keep you honest". Not only will it help you keep your speed steady, it will help you stay at the right place in the song, without jumping ahead or falling behind. These are typical problems for the novice player, that are best solved by playing with a rhythmically correct recording. Current technology and products provide various ways to play along with a correct recording. Computer programs such as The Amazing Slowdowner, and special CD players allow you to adjust any recording to a comfortable speed and key for playing along. Band in a Box is a program that plays a synthesized bluegrass rhythm sound for songs it "knows" or any chord changes you enter in, played back at any speed in any key. Homespun Instruction offers a series of videos I created with a full bluegrass band, playing standards at slow to moderate speeds. The slowest, Bluegrass Slow Jam, uses a total of 4 chords (G, C, D, and A) to play 17 favorite songs at tempos from 70-80 beats/minute. You can practice your rolls and solos over these recordings. Two other videos offer 17 and 22 more standards, and feature "soloing opportunities" in each song, where the band goes into "backup" mode to let you solo over the full band. This is excellent practice for starting your solo at the right time and staying on track, just like at an actual jam. You can even practice being nervous, for more realism! For more info on these videos: www.DrBanjo.com. 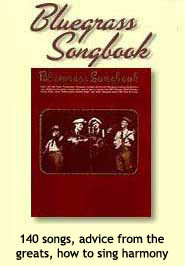 Homespun also has produced a variety of play-along tracks on CD in bluegrass and related styles. For more info: www.Homespun.com. Playing with a metronome is useful for working on steadiness but provides no help for the problem of losing your place in a song, an important drawback for using a metronome to detect and correct timing problems when creating arrangements. In addition, it's just more fun and more like "the real thing" to play along with real music instead of just a metronome click! Be sure you know the chord changes of the piece. Run through the song while strumming the standard chords cleanly on the downbeats, (or if you're able, using a vamp "boom-chick" on closed chord positions, thinking of the "boom" as the downbeat). There are two downbeats per measure of music in basic bluegrass style. Singing, or humming, or speaking the words in rhythm if you'd rather, will make the track easier to play along with later, as the words or melody locate your spot in the song more precisely than the chords alone. Practice singing or humming as you chord. If the purpose of the recording is to practice a solo based on a verse, practice just the verse. It's OK to use the same verse over and over. Make sure your speed will be easy to play along with: 70 to 80 beats per minute is ideal for novice players. This is slower than many songs are normally sung, but still fast enough to keep the roll flowing. If you have a metronome, set it between 70 and 80, and play your strums (or your "boom"s) right with each downbeat click. If no metronome is available*, play the piece or simple rolls for a while at what seems a comfortable speed and then hold the tempo as you switch right into the strums or vamping you will record. Be careful not to speed the tempo when switching from rolls to rhythm. It's tempting, because as mentioned, this speed is slower than most songs are sung! For better recording quality use a decent recorder, set to the "music" setting if there is one. An external microphone adds fidelity. A distorted, muddy recording is harder to play along with. To make sure your voice records loud enough, place the recorder or external mic closer to your face than to your instrument. You can balance the recorder or mic on a chair back, or on two back-to-back chair backs, or place on a shelf. Face height is best. Start the song in a way that will make it easy for you when playing along later, to catch on to the rhythm and the beginning of the singing. After hitting "record", establish a steady rhythm using the first chord, and after about four beats and ready to start singing, give an audible signal such as a count ("1, 2, 3...") or anything, like "Now..." Then start singing and chording along! The signal will help you when you play along. Do a short test recording with a bit of singing to make sure you're recording at a good volume and sound quality before doing an entire run-through. Double-check that your speed is not too fast or slow for comfortable playing along. Make sure both your voice and your chording are easily heard. If your full run-through is not a good speed or a good sound mix, it's not usable, and you'll need to try again. Important: Your play-along track should have several repeats, preferably at least five in a row. The more repeats, the more continuous practice later without having to stop. Don't worry about a flawless performance. The goal is a recording that's easy to play along with. Missed words, notes, or chords, occasional pauses between verses, etc. won't hamper your ability to play along. Rhythm hitches within a verse can be a problem, though. If you make more than a couple or three goofs that might derail you when playing along, try again. After song is recorded, briefly check the end for quality. Did it speed up drastically compared to the beginning? If so, try again. A portable playback unit with earphones is ideal. Adjust playback volume for the best mix with your live instrument. Try listening with one earphone on and one off. If you play back through a speaker, make sure it's loud enough to hear easily while playing along. As soon as you hear the rhythm, start your roll on a beat and try to match your 8-note rolls with the two beats in each measure (first note goes with the first beat; the other beat goes with the fifth note, the halfway point). Try to start soloing in the right place! Try to stay right with the rhythm at all times. Note places where you get off. If there is an error on the recording, note where it is so you can compensate for it next time. If the recording is not in error, go back to where the problem occurred and take some time to try to figure out why you're getting ahead (you played too few notes in one section) -- or behind (you took too long in one section). Ironing out these problems is a big part of what will make you a more solid player. This is where the play-along track is doing its job to help you correct your timing problem! If you stumble, try to get back on track as soon as possible. Stumbles are normal in jamming situations, and learning how to recover quickly is a skill you will develop with experience. When you play with other people, there's no going back when you flub! Just get back on track as soon as you can, at a spot a little further ahead in the song. For novices: Play-along rhythm tracks can be helpful not just for checking solos, but for earlier stages of playing too, such as doing basic rolls while changing chords, or picking out single-note melodies in correct time. It's a good idea to have several play-along tracks together in the same folder of your playback device to make it easy to go from one right to the next. At a jam session where people are playing songs you would like to work on, record the jamming for playing along with later. It might be hard to get good quality, but if you position the mic or recorder near some of the clearer singers, you'll have something to play along with. While making the recording you can quietly call off the chord changes you see, into the microphone. Practice tracks can be made to simulate real playing conditions for a variety of challenges. For accomplished intermediate or advanced players, typical speeds may range from 100 - 150 beats/minute. Keys such as A, B, D, and E will sometimes be used, requiring accurate capoing and knowing the chord positions in these keys on different parts of the neck. You can practice backup and lead and the transitions between. Years ago, I produced a series of play-along recordings with the Country Cooking band, for the Music Minus One company. They are still available as three matching sets, one for banjo, one for guitar, and one for mandolin. Each set includes the same 14 standards on two CDs, one at typical "fast" speeds, and the other slowed-down to more "intermediate" speeds (100-120 beats/minute). The faster CD has all 14 tracks by the full band, including vocals and lead breaks, with that set's instrument separated to one stereo channel. This enables removing that instrument from the mix for realistic playing along, or turning up that instrument for closer study throughout the track. Each set also includes a tab book for 11 or more solos as played by the featured instrument. These sets are all available in the Store under Books at www.DrBanjo.com. If you are fortunate enough to be in a band, see if you can get the band to record some songs without you playing, and then you can practice on your own with that recording! This will help you make sure that your breaks "work", and you can resolve timing and accuracy issues before practices. For more instructional articles on banjo playing and jamming, see The Doc's Prescriptions under Instructional on www.DrBanjo.com.